The Golden Circle Iceland is a classic to explore. Either jump in your car and drive around or start from Reykjavik on one of the many Golden Circle Tours. Either way, here is a Golden Circle Iceland map with an introduction to its highlights: Thingvellir, Haukadalur and Gullfoss as well as other lesser known stops. However there are many roads that you can take around with other things to do on the Golden Circle Iceland thus creating a round itinerary. I will tell you more about each in the next sections. All theses locations, along with many other beautiful places, are included in my eBook: The Road Trip Guide - Iceland. It is easy to drive yourself around the Iceland Golden Circle as the roads are well maintained. A great road trip in Iceland. If you don't feel like driving or want to feel free to admire the scenery, you can join one of the many Golden Circle Iceland tours departing Reykjavik. Better to day full day ones because there is a lot of driving! Thingvellir National Park (in Icelandic written Þingvallavegur) is a Unesco World Heritage site for its geological and historical importance. It is a series of huge fissures in the Earth's crust caused by the rifting of the North American and Eurasian plates. In one of them is the Oxararfoss waterfall with a 20 m high drop. It is a 45min drive from Reykavik via Road 1 and Road 36. For more photos and planning information, check out my article dedicated to Thingvellir National Park Iceland. Haukadalur is a geothermal area, home of the famous Geysir. However the geyser that you will see erupt is Strokkur. It displays its power every 5 to 8 minutes, sending water 20m high (and sometimes up to 40 meters). You can also walk around and discover mud pools and fumaroles. The Haukadalur Geysir geothermal area is located close to Road 35. It is a 50 minute drive from Thingvellir. For more photos and planning information, check out my article dedicated to Haukadalur Geothermal area. Gullfoss is one of the most famous waterfalls in Iceland. Located on the Hvita river, it rushes and falls 32m (105ft) in two stages. Its flow is impressive, reaching 140m3/s in the summer time. You can reach Gullfoss on Road 35. It is a 10 minute drive from the Haukadalur Geothermal area. It will take you 1h30 to drive back to Reykjavik via the same road or 1hour to drive to the town of Selfoss. For more photos and planning information, check out my article dedicated to the Gullfoss Waterfall Iceland. Have a look at this short video introducing those 3 main things to do on the Golden Circle Iceland. 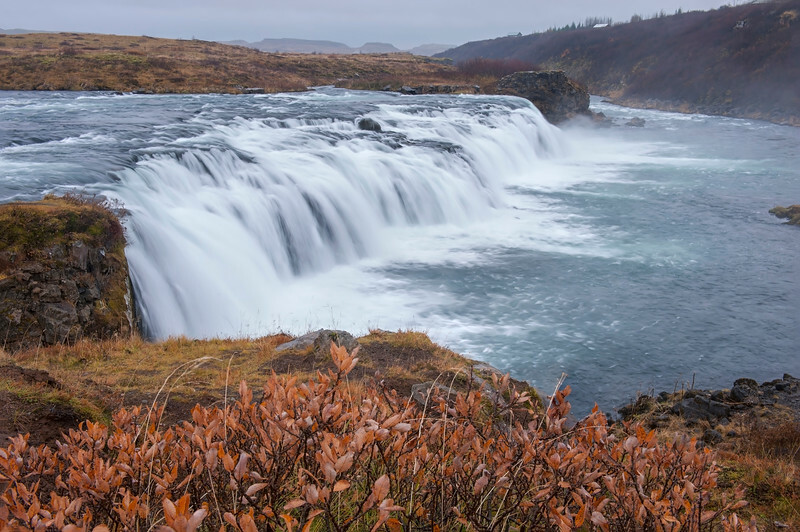 Below are other places to see if you loop around the Golden Circle Iceland. Sadly I was on a tour so I did not stop there but I found pictures for you to help you decide if you include them on your itinerary. They correspond to the places listed on the Golden Circle Iceland Map at the beginning of the article plus one detour. Laugarvatn is a small lake not far from Thingvellir National park. The population is mainly on the west side. The lake as a geothermal spring. So it is a great swimming spot with warm water all year round. There is also a spa Laugarvatn Fontana taking advantage of the spring. The waterfall is located between Laugarvatn and Geysir. Apavatn a 13km2 lake, a large flat area good for fishing. It does not seem to be very photogenic. with little mountains around. 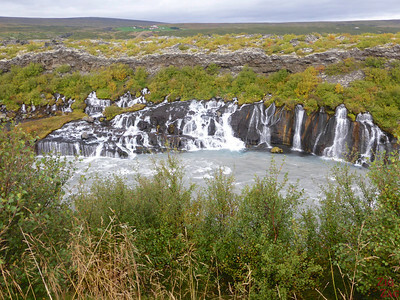 Near the town of Faxi is the waterfall Faxifoss. A gravel road will take you to this waterfall where you can admire and fish salmons. On its side is a salmon ladder to help them move upstream. For those looking to escape the crowds of the Blue Lagoon, your can try the secret lagoon. The facilities are not as extensive but you could have more peace and quiet to enjoy the place. Kerid crater is appreciated for its contrasting color. 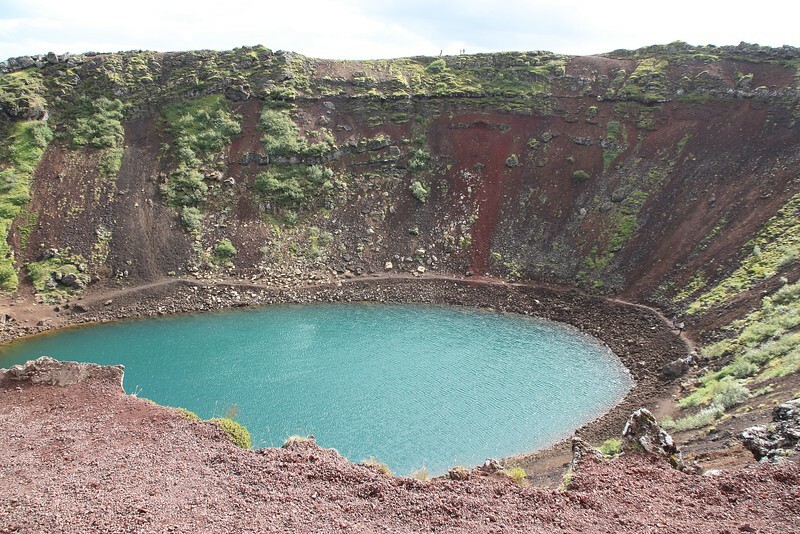 With the turquoise of the pond in the caldera, the red of the volcanic rock and the green in summer or white in Winter. 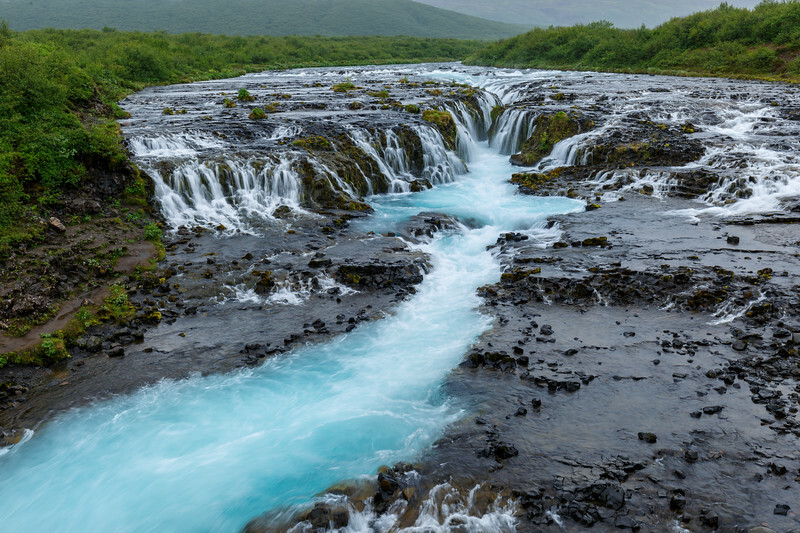 Often when coming from the Snaefellsnes peninsula or going to the peninsula after on road 52, people take the detour via road 560 to reach the beautiful waterfalls of Hraunfossar where water flows through lava. For those visiting the Golden Circle Iceland in Winter, the roads to the 3 main attractions are normally well maintained. However this is still Iceland in Winter, so make sure you understand the basics of driving on snow and ice (no hard breaking, no turning sharp turns...). If you don't feel like driving in those conditions, pick one of the Golden Circle Tours. Note that access to get closer to the top of Gullfoss would be very slippery and dangerous and can be closed. However the waterfall is stunning with those iced area mixed with flowing water. Because of the volume of water, this one does not freeze entirely. Due to the heat from the geothermal activity, the access to the Strokkur geyser remains easy. Stay is near Haukadalur. This way you can go late evening and early evening to both Gullfoss and Haukadalur when all the big bus have left or not yet arrived. This way you can experience them almost by yourself. I personally stayed at the Geysir Cottages right next to Haukadalur. The food was tasty in a room with atmosphere. The room was comfy and clean. It allowed me to go early to the geyser before all the tourists arrived. More information and my review on my Iceland Accommodation﻿s article. Want to see more of ICELAND? 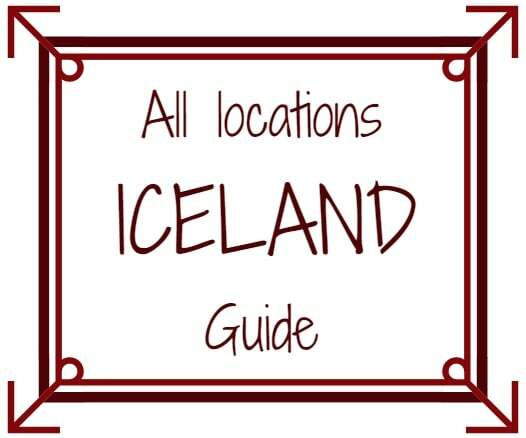 Discover more things to do & places to see in my Travel ﻿﻿﻿Iceland﻿ ﻿Destination﻿ Guide. Is the Golden Circle Iceland on your itinerary?